The Onion A.V. Club has been reviewing classic Simpsons episodes, starting with “Simpsons Roasting on an Open Fire” and working its way forward. 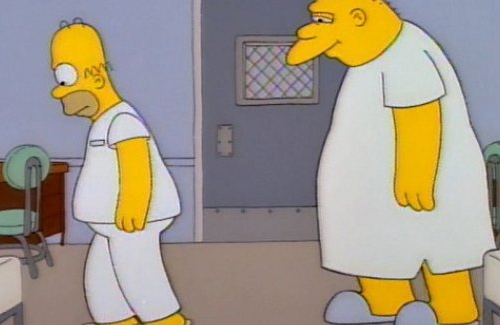 Today, Nathan Rabin reviewed the third season opener, “Stark Raving Dad,” best known as the Michael Jackson even though Jackson’s name appeared nowhere in the credits. In the review, Rabin points out the strangeness of Jackson’s anonymous-but-not performance and some of its racial implications. For reasons lost on the show’s writers and producers, Jackson insisted on having a white soundalike record the singing for the episode, though the show’s crew suspects he might have swapped in his own singing at the last minute. This further complicates and problematizes the show’s racial element; a white man was hired by a famous black man to sing in the famous black man’s unmistakable voice while he, Michael Jackson, did the speaking voice for an anonymous white man who wants the world to think he’s a famous black man. Got that? Thesis! Really, why does Michael Jackson Studies not exist already?